How She Move tells the story of Raya, a girl who has dreams of becoming a doctor, but finds her dream may be cut short when she is unable to continue private school due to economic issues, and returns home after her drug-addicted sister kicks the bucket. So what's she do? Why, enter a dance troop and win a competition which will give her the money to continue her schooling... I mean, obviously. Let's not kid ourselves here, the plot is really secondary to the dancing, and pretty much serves to move from one dance sequence to the next. I found it to be a tired and bland story that I felt like I've seen done better many times before. But as I said, a movie like this really isn't about the story, it's about the dancing. And unfortunately I didn't care for the dancing either. I don't recall what type of dance they called it, but basically it's just a lot of stomping of feet and slapping hands against body to produce noise. Now, I'm not say it's bad dancing or anything, I'm just saying I found it boring to watch. I'm not a big fan of watching dance, but my wife enjoys So You Think You Can Dance , and I must say I like the dancing on that show WAY more than what I saw in this movie. They did throw in some hip-hop moves into the mix, but it wasn't nearly enough to make it interesting. The acting was descent for the most part. Um... the music was average. Not terrible, but nothing I wanted to hear again after it was over. I'm not really sure what else I can say about this film. So far I haven't written nearly as much as I normally do, but I just don't know what else I can say. The plot was thin, neither my wife nor I found the dancing enjoyable, and in several places neither of use could even figure out what exactly was transpiring. We watched all three of the extra features found on the disc, The Character sof How She Move, How She Move: From Rehearsal to Film, and How She Move: Telling Her Story, but none of them brought new light to the film. Although we did learn that it was a big deal for them that they filmed in Canada and the movie was set in Canada. When we heard this, we both looked at each other and said "it took place in Canada?" Even if you like dance movies, I'd say skip this one. Maybe if you absolutely LOVE dance movies, then perhaps give it a rental. But I can't see anyone watching this and thinking wow, I've gotta have this in my collection! 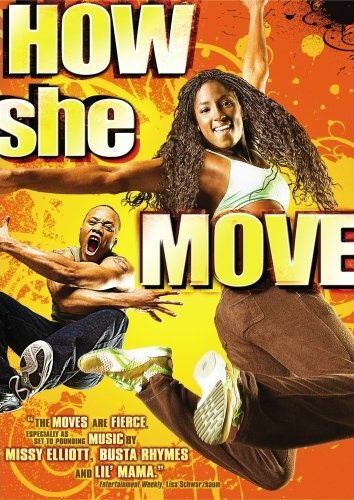 How She Move , released by Dreamworks, is available starting April 29, 2008.